Fewer defects! Teams practicing TDD regularly report 90% or more fewer bugs,significantly reduced maintenance costs, as well as higher quality, easier to understand,more flexible code. For developers, Behaviour Driven Development is a form of Test Driven Development that makes TDD easier to learn, easier (even fun!) to practice, and that results in higher quality, more focused, and more effective tests. Teams also experience a significant reduction in manual testing effort, especially when combined with automated acceptance testing. 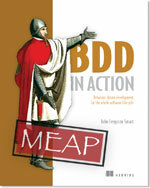 BDD encourages developers to write tests in the form of executable specifications. The unit tests act ascomprehensive regression tests, making the code much easier and safer to change, and also provides illustrated examples of how to use the services and APIs in your application. This course is a practical and hands-on introduction to Test Driven Development and Behaviour Driven Development. Students will learn how to write high-quality unit tests, or more precisely, "executable specifications", to write better designed, more maintainable and more reliable code. Students will also discover how BDD helps keep development focused on the real requirements, resulting in a higher quality product for the end user. These are skills that every developer needs to master.